And so, whilst End-Of-Year lists scatter all around us, ANBAD introduces the final Midweek Mixtape of the year. And, as always, putting it together each week has been a guilty shove-’em-in-and-see-what-happens pleasure. 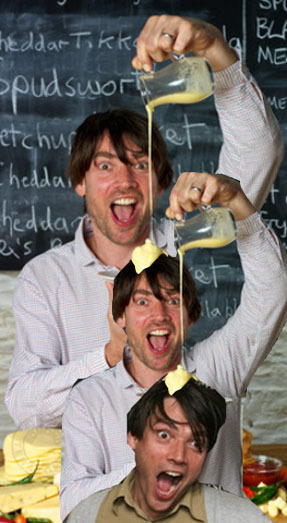 Star of this year’s Mixtape show has been Britpop’s King Of Cheese. No, not, Liam Gallagher – although his Beady Eye gigs have had a distinct whiff of Stilton about them – but Alex James, a man who spent a million pounds on Champagne whilst being the Handsome One Out Of Blur. He’s been pouring his own-brand molten cheese over a relevant person each week. As a special treat for Christmas, this week he’s aiming for cheese upon cheese upon cheese: Cheese-ception. FIRST! Super Clarks have an endearing quality that is hard to pin down – but such categorisation is, as always, needless when the songs are good fun. And that’s exactly what Interesting, Not is: a polyrhythmic shudder of grooves, excitement and jangling. SECOND! Little Chestnuts are, like Lisboans Super Clarks, a Euro-band of the sort I always feel pangs of guilt and empathy towards because I know that they’re being cruelly overlooked by an Anglo-centric press. Fight the power, kids: and enjoy this super-classy slice of slick pop from Genova. THIRD! Greater Alexander isn’t gloomy – his records just make him seem that way. Any Way Out Of It‘s acoustic pitter-patter pummels your mind with a thousand tiny, fluffy bean bags, and, briefly, time stands stiller than still. Aaaaah. Posted on December 14, 2011 by Joe Sparrow. This entry was posted in Headline, Today's New Band. Bookmark the permalink.